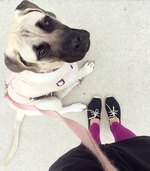 How Far Should I Walk My Dog? If you are beginning an exercise program, it doesn't take long to learn the signs of when you're becoming fatigued. While pushing through some fatigue can help you become stronger, at other times you simply need a break to rest and rehydrate before you cause an injury. For your dog, however, figuring out when a walk has gone on long enough is not easy. After all, the dog cannot verbally tell you when it needs a drink of water or when it's feeling joint pain. Fortunately, paying attention to certain signs in your dog's behavior can indicate when a walk has gone on long enough. A dog that is nearing the end of the walk will slow down considerably or it may start to limp. The dog might not appear happy, no longer wagging its tail. And some dogs will just lay down when they've had enough, but you want to figure out the signs well before this occurs. When considering how far you should walk your dog, you should think in terms of time, rather than distance. Because each dog breed is a little different and is of a different size, a 1-mile walk for a golden retriever is going to be vastly different than a 1-mile walk for a Chihuahua. A general rule of thumb is an average dog in good health should be able to easily tolerate a 30-minute walk daily. If you have a more active breed, as much as 60 minutes may be tolerable. An older dog or a breed that is more sedentary may be better served with a 15- or 20-minute walk. However, make sure you know whether your dog is healthy or not. Certain behaviors that may seem slightly weird may actually be signs of illness. This could impact the amount of time your dog requires to be walked significantly. Another strategy is to try breaking up the walk into two sessions. Perhaps a brisk 20-minute walk in the morning followed by a 45-minute walk in the evening would fit your schedule well. An older dog or a puppy may tolerate shorter, but more frequent, walks better. Keep an eye on the weather too. If it's a hot day, cut back on the walk time, especially if you're only able to walk on hot pavement. Or if your dog seems especially frisky on a cool autumn day, adding another 5 to 10 minutes to the walk shouldn't cause any problems. As when humans begin an exercise program, it's also important when your dog begins going on regular walks to make sure you don't overdo the workout. Too much exercise will leave the dog sore and less willing to go on a walk the next time. Start slowly with the program and build up to the desired walking time. If you have a large dog, a gradual build-up of stamina is even more important to prevent joint injuries. Start with 10 minutes for a few days, then 15 minutes for a few days, and onward until you reach the ideal walking time. Always keep in mind just how far you are from home as you're going on the walk. If you're walking around the block, you'll end up close to home eventually. But if you're walking along a point-to-point trail, you don't want to go so far in one direction that your dog becomes worn out on the outward leg, leaving a miserable trek back on the inward leg. Always be conservative when trying to decide how far to go in one direction. You can retrace your steps a little bit once you return to the beginning of the trail if you want to add a bit more to the walk. And if your walking path is mainly downhill on the outward leg, keep in mind that it'll be a primarily uphill trek on the inward leg, which will be much more difficult for the dog. Although you will receive some extra exercise, you certainly don't want the dog to just lay down on a big hill on the trail, forcing you to have to carry the dog back home on the inward leg … although that's where having a smaller breed is a significant advantage! What Is a Companion Dog Certification?